20:00 Pick up from your hotel & transfer to bus station. 21:30 Depart from Istanbul. Bus trip takes around 10 hours. There are three breaks on the way for your personal needs. 07:30 Arrive Kusadasi or Selcuk. Met on arrival & transfer to hotel. You will have some time to relax and fresh up. Breakfast at hotel. 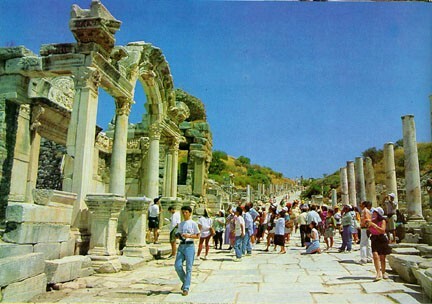 09:30 You will be picked up from your hotel for Full day tour of PERGAMUM. In Pergamum, you will be delighted to visit the Asclepion and Health Centre. As you make your to Acropolis, the Red Basillica, originally a temple of Serapis, can be viewed. The most spectacular structure is certainly the theatre, a remarkable piece of engineering built into the steep hillside. After the tour, you will be transfered back to your hotel. Overnight 2. Breakfast & check out the hotel. 08:30 You will be picked up from your hotel for Full day tour of Pamukkale. In Pamukkale, you will see the Cotton Cliffs, one of the natural wonders of the world formed by deposits of calcareous salts. Also visit the ancient ruins of the City of Hierapolis with its basilica, theatre and Roman Baths.After the tour, transfered to bus station. 21:00 Depart from Pamukkale. 08:00 Arrive back in Istanbul & transfer to hotel.